Sponge balls are fun, easy to transport, and very entertaining in the hands of a magician. They are also easy to learn to manipulate at a very basic level. The magician holds up a red ball made of foam-sponge, about an inch in diameter. The ball is held between the thumb and forefinger for all to see, and then is placed in the magician’s other hand. With a small wave of a magic wand the hand is opened to show that the sponge ball has vanished. The very nature of the sponge ball allows it to be compacted into a very small space and makes it very easy to manipulate. Sponge balls are all that are required. A basic set can be bought for a couple of pounds and will provide all a magician needs for an entire routine of magic tricks. Practice is key here, not just of the individual slight of hand moves but especially for routines both small and large. The sponge ball pinch follows the same basic concept of most vanishes- the magician only appears to place the sponge ball in the opposite hand, or in a pocket, or under a cup, or anywhere, while actually retaining the sponge ball in the hand where it started. Before performing a trick with a sponge ball, first the magician needs to know how to pull off the sponge ball pinch. Natural motions are key to pulling off any vanish, and this is no exception. The sponge ball should be held between the thumb and forefinger of the right hand. Your hand should be out a little over waist high, palm up. Flaring the fingers of the right hand not holding the sponge ball is purely for effect, but does help to highlight the ball held. The magician holds out his left hand, palm open and up, and moves the right hand towards the left. Still pinching the sponge ball, the magician places it in the left palm and then begins to close the left hand, hiding the ball from view. As the fingers of the left hand provide cover, the magician rolls the forefinger of the right hand down towards the crook of the thumb, pushing the piece of sponge held before it. This puts a piece of the sponge ball in the crook of the thumb. From here the magician needs only keep the thumb along side the hand to hold the sponge ball in place. The magician withdraws the right hand as the left hand completes the closing motion. The right hand drops to the side as the left hand comes up, the magician’s attention fully on the left hand. The magician may now use any theatrics he pleases to make the sponge ball “vanish” from the left hand. The right hand may then reach into a pocket to “retrieve” the ball that supposedly transported there, or perhaps behind the ear of a spectator for a classic retrieval. This is the basic sponge ball move and will open the door to many, many more. 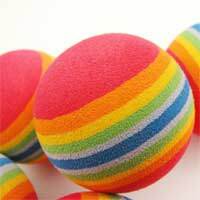 Buy at least four sponge balls and you will be able to perform a wide variety of tricks, and even build entire routines around them. From there you can acquire many novelty sponge props, such as rabbits, hotdogs and hammers for a lot of magical sponge fun.